Today Google announced that its search algorithm underwent an upgrade which affects 35% of the searches. The algorithm is tweaked to give more recent information where it matters. For example searches like sports events, elections and product reviews demand more fresh results than the other searches, this change will affect these kind of searches. Explaining the change in the algorithm Google engineer writes “If I search for [olympics], I probably want information about next summerâ€™s upcoming Olympics, not the 1900 Summer Olympics (the only time my favorite sport, cricket, was played). Google Search uses a freshness algorithm, designed to give you the most up-to-date results, so even when I just type [olympics] without specifying 2012, I still find what Iâ€™m looking for. Today announced changes are built on Google’s “Caffeine web indexing system”, which allows Google to crawl and index the web for fresh content on a large-scale. Recent events or hot topics: For recent events like sports events searchers expect more recent information, in this regard the results might be only minutes old. 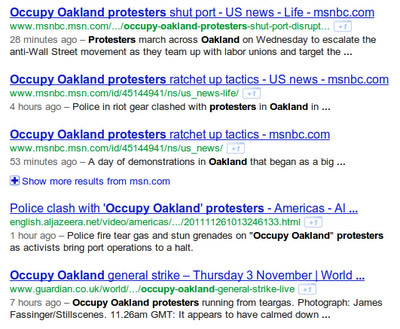 See the example image below for search query “occupy Oakland protest” showing the latest information. Regularly recurring events: Some events like elections takes place at regular intervals, and when you search for presidential election you want information that is fresh, not years old. These type of searches show latest information to the searchers. Frequent updates: In the case of product reviews you might want the latest reviews about a camera, in this case the more relevant and fresh product reviews will come up first due to the recent changes in Google’s algorithm. Google says “Different searches have different freshness needs. This algorithmic improvement is designed to better understand how to differentiate between these kinds of searches and the level of freshness you need, and make sure you get the most up to the minute answers”, in a blog post on official Google blog.